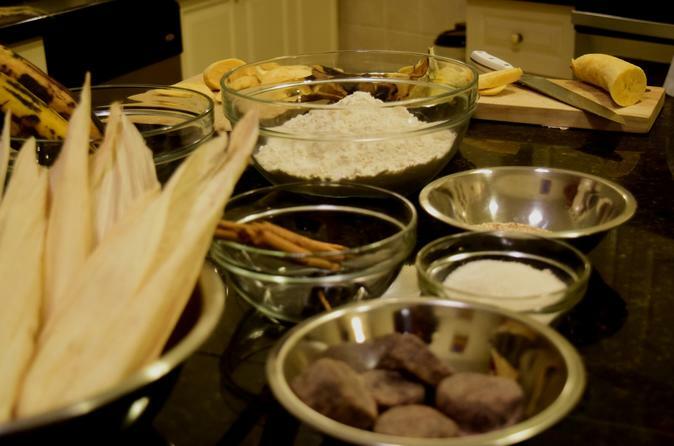 During this Guatemalan cooking class we will learn to prepare a 4 course meal under the guidance of a professional chef. Your expert chef will introduce you to the typical flavors of Guatemala as well as explain to you the history of each dish you prepare. You will be guided just enough to give you the freedom to cook with your own style, while still recieving proper instruction so you know exactly what steps are next while you work with fresh and seasonal ingredients. After we have finished cooking our wonderful dishes together, we will sit down and enjoy the delicious creations. During the lunch I will be able to give you insight into Guatemalan food and explain to you more in depth about the history and traditions of Guatemalan food. Some of the dishes we might cook include the well-loved rellenitos, this is a dish of plantains stuffed with black beans. Plantains and black beans are the most utalized foods in Latin America and for good reason - this dish is sure to please any travelling foodie! Also on the menu is typical Guatemalan rice, a well seasoned dish that pairs wonderfully with warm corn tortillas and sauteed vegetables! Next, is either Jocon or Pepian ! Both of these dishes are meat based, hearty soups, with spices and vegetables traditional to Guatemala. Some of the foods we will work with include chiles, garlic, green tomatoes, onion, potatos, cinnamon, sesame, pepitoria, green beans and a heaping garnsih of aromatic cilantro! Among these dishes you will also learn basic salad recipes that include minimal ingredients but offer bold flavors. And when it comes to drinks, we will be sipping on nothing but traditional drinks such as horchata or jamaica!